Large-scale images have the power of scale to dominate the look and the mood of interior spaces. It’s easier than ever to transform a room in a few hours with very little mess with interior photo murals. These are digitally printed, come in workable panels, and have self-adhesive and often removable properties. Digital printing has been the game-changer for photo murals because it allows photos to be printed in very large formats rather economically. This is not your mom’s wallpaper or even her collectible art. Views of Paris have been popular since the 17th century. As architectural landscapes they were often monochromatic etchings or prints done in a series and, of course, the format was relatively small. 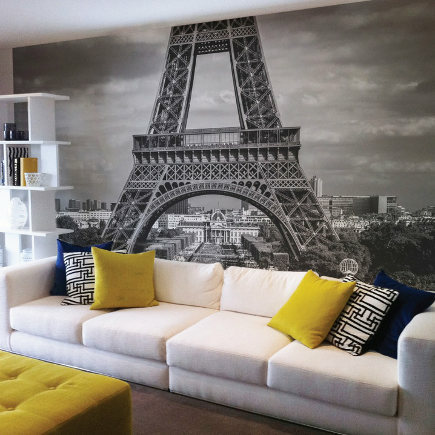 But even a grouping could not produce the impact of The Wall Sticker Company’s stunning black and white Paris mural [top], 12-1/2 feet by 8-feet in 6-panels, with self-adhesive backing. 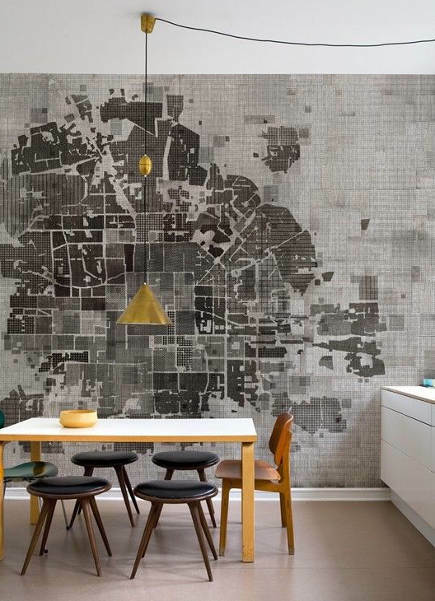 Among many choices from the contemporary Italian wallpaper concern Wall&Deco, is No Plan, a grey print that lends itself wonderfully to modern wall spaces. It has a map-like effect while still remaining abstract and non-specific. The Pepins, a brother and sister team from Quebec, offer a variety of art for the home including White Bricks, a 12- by 8-foot mural that puts an instant-loft look on any wall. Some images have the potential to go weird or creepy in large formats. 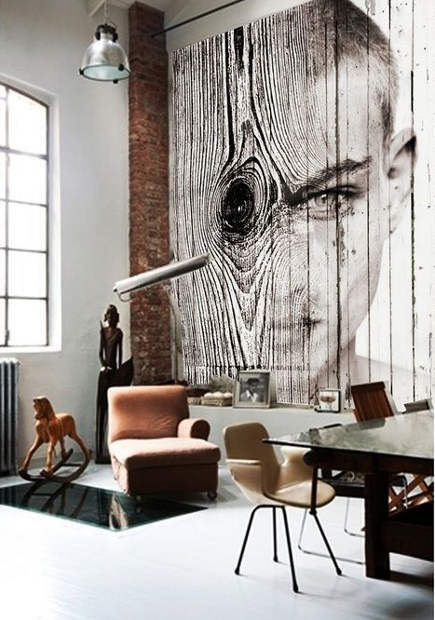 Spanish photographer Antonio Mora edges up to that and yet this conceptual marketing piece shows how his contemporary surrealism injects a hip, young vibe into an otherwise nondescript space. Trees are huge for walls. One of the most striking is the wind-blown flowering quince painted by artist Jeff Robinson (after a mural by Paul Poiret) in the whimsical West Hollywood apartment of Kate Schintzius, an associate at M. Design, Molly Luetkemeyer’s firm. (See Luetkemeyer’s work in our post on Designer Rooms for Kids post). Apartment Therapy and the L.A. Times also featured the mural (the Times’ photo made it look black), while documenting a trend then underway in Tinseltown. Wind-blown palms on a beach in Micronesia take the tree theme tropical. That may be a love-it-or- hate-it proposition but at 4- by 6-feet, the relatively scaled down single panel from All Posters.com, could be considered a cool nod to Gauguin, or just a little too Hawaii Five-0. Whatever. It’s stain-resistant and comes with paint-safe hanging strips. Who doesn’t love the colors of a beautiful beach? 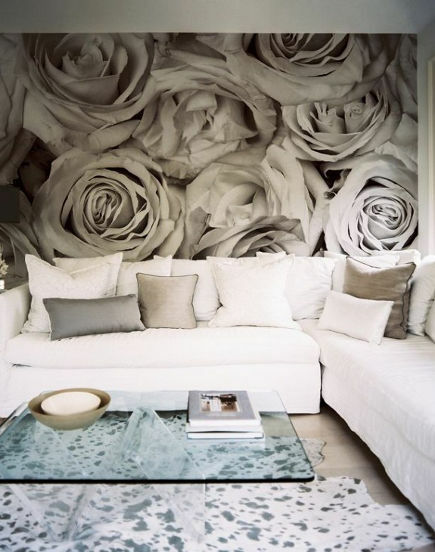 In black and white, oversize roses don’t seem aggressive which is why this image supports a living room with a contemporary sectional and cowhide rug. In color, maybe not so much. I imagine this would not be a difficult shot to DIY given the right light, a really good camera and a trip to the flower market. Then find the a good digital printing source, attach the jpg, press Send and the project is halfway home. I fell in love with the black and white roses wall mural that was in your magazine dated November 4, 2013. 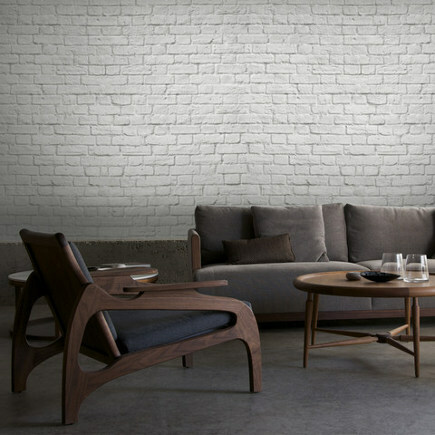 Is there any way to purchase this mural? Hope, hope, hope – thanks! 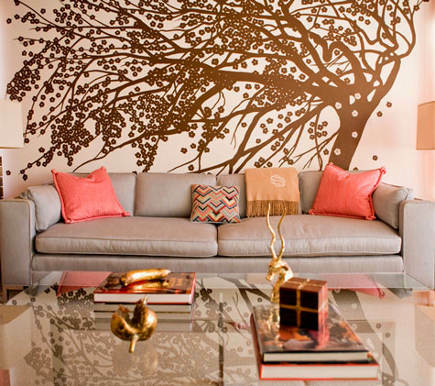 The mural you like appeared in Lonny Mag. The exact page is linked at the bottom of the post. However, they don’t give any source for the mural. I would contact them and ask if it can be purchased in black and white.